i'd like to give away a new 4" x 6" stillman and birn sketchbook. it's a 'gamma', which means that it has 100# ivory paper suitable for just about anything in it. i've happily used watercolors, casein paint, gouache, ink, and colored pencils in mine. to enter your name in the draw, just leave a comment, and international readers do not be shy about leaving your name! this'll fit in a small flat rate box that i can send right off to you! 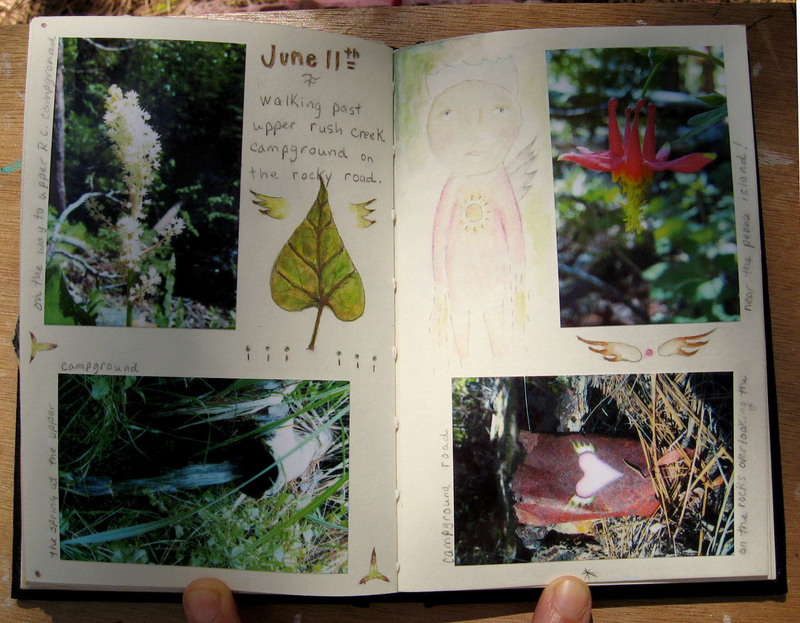 here are some recent pages in my daily book, which is also a gamma. i adore these books! i think everything here was painted with albrecht durer watercolor pencils. i love them too! the inside front cover - for a long time now i've left the inside front and back covers as a place to add miscellaneous bits as i go along. when i look back at the books later, these pages somehow tell more about me at the time than the rest of the pages put together... and somehow they always get covered completely by the time i'm finished with the book. my daily book and the new gamma... i've taken the centerfolds out of two signatures in my book to help accomodate the bulk of so many pogo prints. i'll draw a name sometime within the next week; please feel free to ask questions! edited to add: wow! i usually reply to comments via e-mail, but i'm going to just say one big thank you here! re: where to buy stillman and birn journals... here's a list of both online and retail (brick and mortar) sources. all other questions i'll answer in the comments section so that everyone can see the answer. I would love to be considered for your draw. 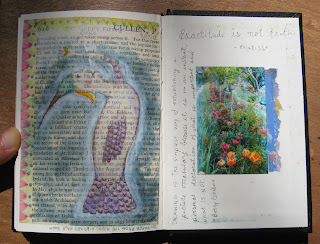 I am always looking for my next Journal that will stand up to water colors and collage. I love seeing how you use yours too. ps: I'm thinking of having my own little giveaway soon (artwork) but i'm not sure how to go about picking the name... do you do it electronically or just pick out of a hat? oh my gosh, i adore your office! It's perfect! Thank you for this opportunity, I would love to win such a gift. I agree, our art journals tell such a story. I plan on leaving mine behind for, my 4 children. They are always so interested in my artful journey, I figure this will give them a chance to understand me, my passion for art, and why I create. What a great giveaway!! I love how you combine your paintings with your pogo prints - very inspirational! Love your paintings, as you know. (I'm (one of?) the person who tried painting a face from your tutorial. It wasn't great but I was pleased enough to keep it lol) And I'd love to win that neat little journal. Thanks for the chance! okay maybe if it came from you I'd actually use an art journal on a regular basis! I'd be surfing along on your wonderful energy. So yes I'd love to have a chance at that. My favourite part is your office!! I don't think it get's any better! Happy office days! I love your office Lynne! fab dressed in shadows and light. how wonderful that you are giving this book away. I have been so curious about them ever since you have been sharing these books. Loved seeing your artful pages! I love your office! I really like your journal. Having a POGO camera looks like so much fun. I have digital cameras but usually don't get anything printed. 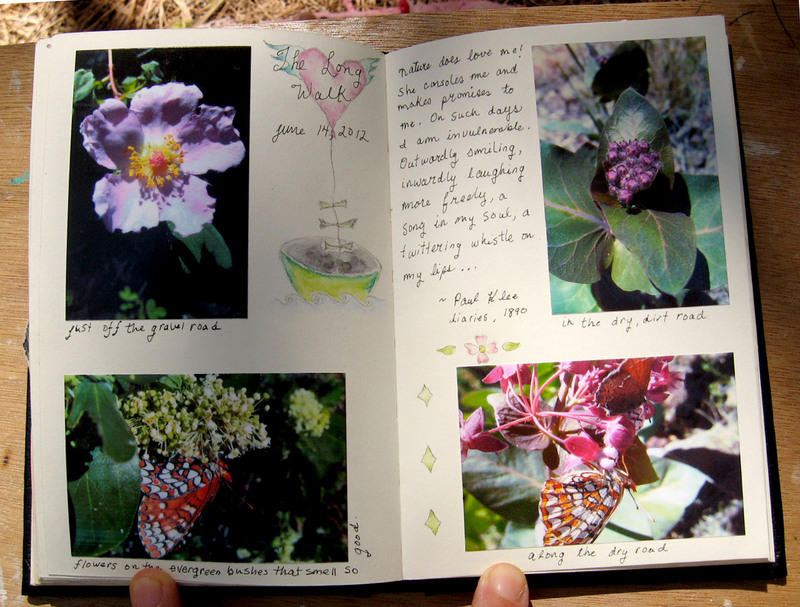 I really like the idea of having an instant printout to stick in a journal! My grand daughter would love this journal and a camera. Who wouldnt? You are an angel and I am so curious to see a history of those inside covers. Love your work and would love the opportunity to win. I've not used this particular type of journal. I love little books like these. I have a similarly sized one that I love to use. Yours looks so lovely, I'd love to have a look through them! Oh Lynne - how generous! It would be so fun to start a new journal at my new house! 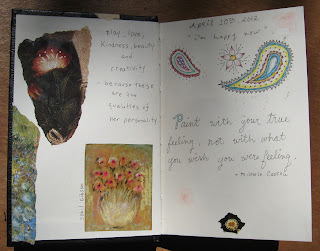 Yours are always such an inspiration -- and surely the journal would come infused with your beautiful spirit! Oh what a beautiful place to work! I love little books like this and the work you post here on your blog has inspired me to start working in my sketchbook more often. Love the pogo prints too, they're a brilliant idea for getting photos into your sketchbook! What an office you have !!! Love that ! The gamma looks wonderful. New places to spill myself are always appreciated and such a high quality one would be lovely ! Thanks for the chance, Beautiful ! Enjoy your workplace today, my amazing Friend. ps - the mermaid on the inside back cover blows me away. Love love love it. Maybe a little colored copy print for me in the mail ? I will find a Kim tidbit to send you in exchange. ;-)No pressure ! The book and especailly what you have put inside of yours, are wonderful inspriation! Never met a journal I didn't like.....sure I would LOVE this one. Thanks for the opportunity. Thank you so much for this fun giveaway! Your pages are lovely! Oh I'm so glad to have discovered your blog! What a treat! I have been itching to try any of the Stillman & Birn sketchbooks so please count me in! How generous of you! But I'm not commenting to enter to win the book. :0) It just struck me that you said the book you're giving away has ivory pages. So, of course, I had to look at your finished pages (even more!) closely to see if you always use ivory paper, instead of white. :0) It's hard to tell in the photos, but I suspect the ivory might be what helps your images have that luscious dreamy quality. That, and your special Lynne H touch, that is! Your office looks heavenly, too, by the way! I love your sketch books! I LOVE the S&B gamma books, and would truly appreciate being a winner (for once). Your pages are beautifully done. Thanks for doing this giveaway. One can never fill enough journals. :) Happy weekend! Loving the office almost as mich as your work. Very kind of you to do this giveaway. Michael from S&B sent me some samples and I was blown away but can't get hold of any books here in the UK. 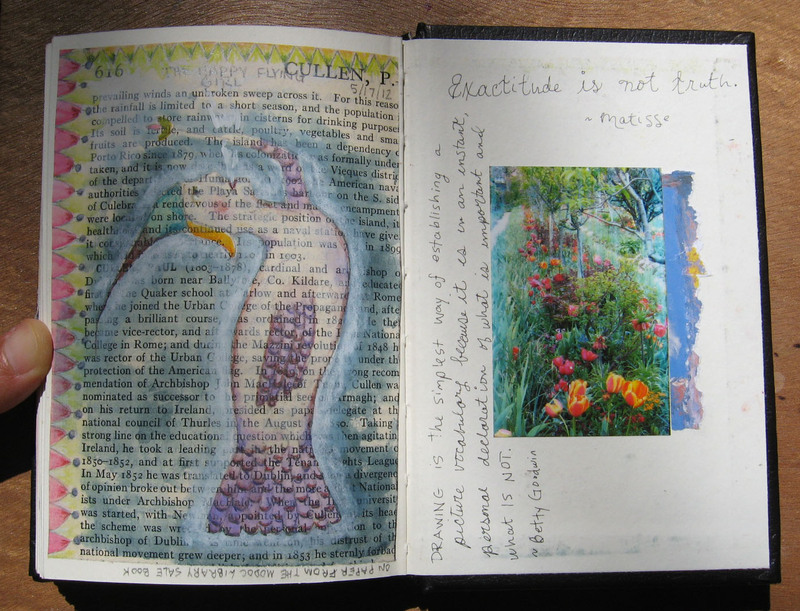 I'm a fan of art journaling. I generally us a fountain pen or brush but looking at your mixed media pages has inspired me to take a turn in the path I'm following artistically. Thank you. Love the photos! I am new to your blog and will have to spend some time looking around. Would love to try one of these books too! Thanks for hosting the give away! I found out about your blog through Stillman and Birn -- love it! And thank you for being so generous as to offer this fine little sketchbook -- I'm so excited about this new line of theirs. Keep up the good journaling work! How generous of you Lynne. Thank you for this draw. 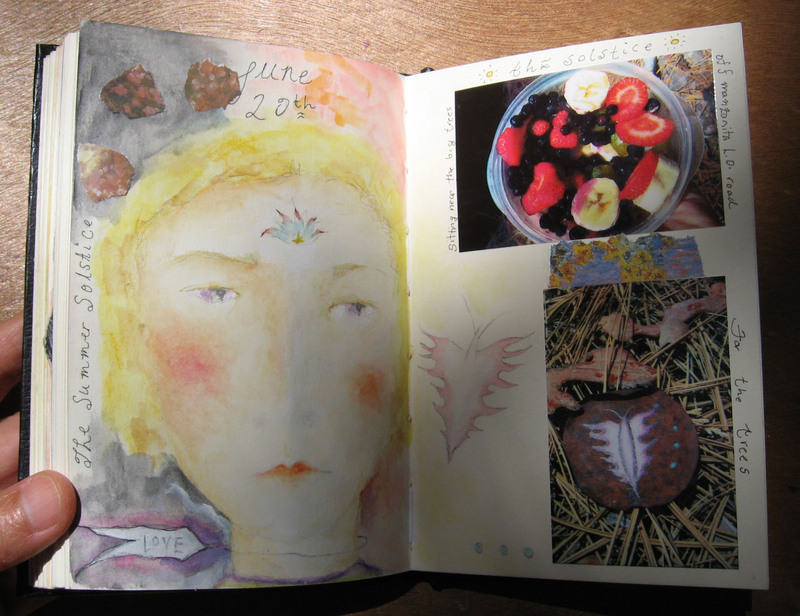 I have been wanting to start a daily sketchbook this summer. This will be a good kick in the bu... for me. 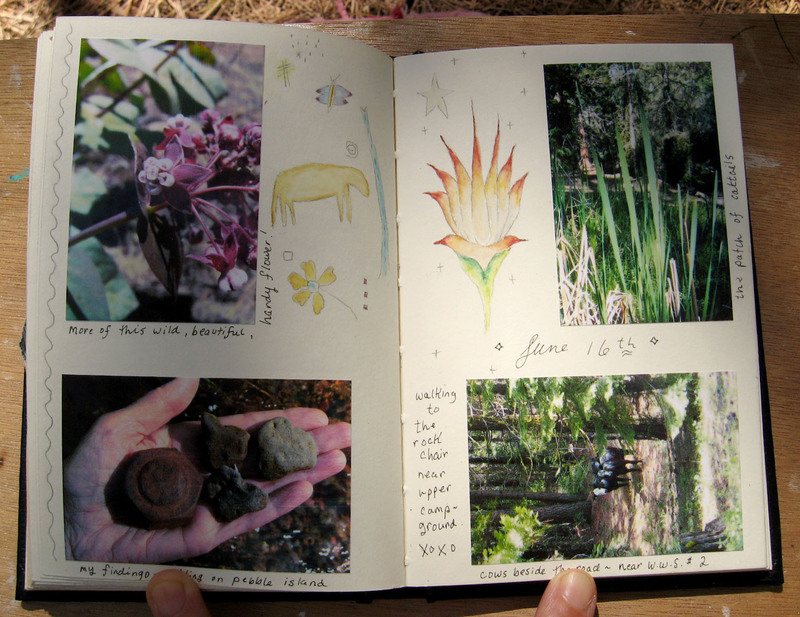 It would be nice to win a kind of journal I've never tried before. As always, I enjoy taking a peak into your sketch books. You have the best office Lynne! I would love a chance to win a journal just like the ones you work in. I've been curious about them for a while and so inspired by your pages. Really sweet of you to offer a drawing like this, it was also really nice seeing your own drawings and thought processes. Thank you for sharing! I have to ask do you get your art supplies online? I'd love to know where to get one of these and I'm not sure my online canvas provider has one similar. How fun, what a wonderful way to collect your inspirations in, might just be what I need for my jewelry designing. How wonderful - I received some sample sheets from Stillman & Bern and would love to do some more experimenting. I think I need to find an office like yours too! Wow! Your work is so beautiful and you're generous too! Thanks for spreading good feelings and beauty! Oooooh I'm drooling over your beautiful pages! 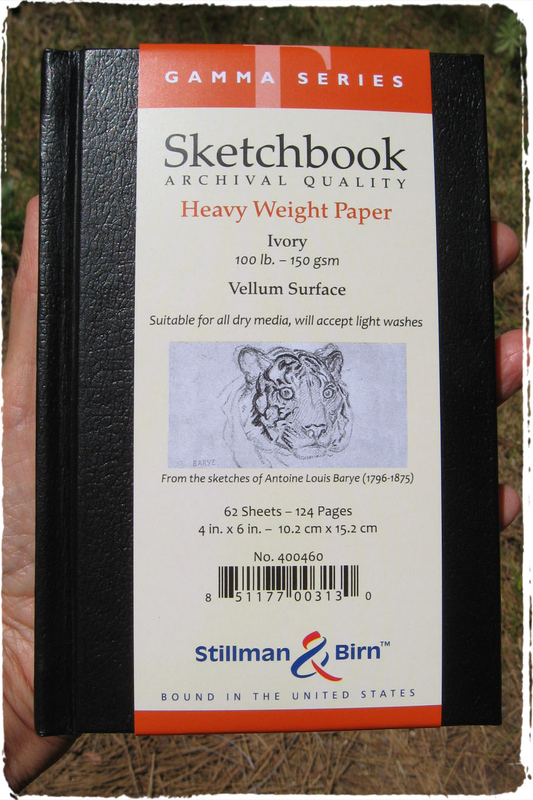 I'd love to have a Stillman & Birn, but we can't get them here in England. I'm looking forward to the drawing, and I'm looking forward to drawing as well! I'f I thought jumping up and down and shouting "Pick me, Pick MEEEE" would help, I'd be doing that as well!! Thanks for your generosity! I would like to be included in the drawing. I would love to try the Stillman & Birn sketchbook. Your journals are super,maybe the Stillman & Birn sketchbooks are too, hope I get to try it out! Hi, I have never used one of these books and I adore you giving us a chance to win. Such fun to see your lovely pages. 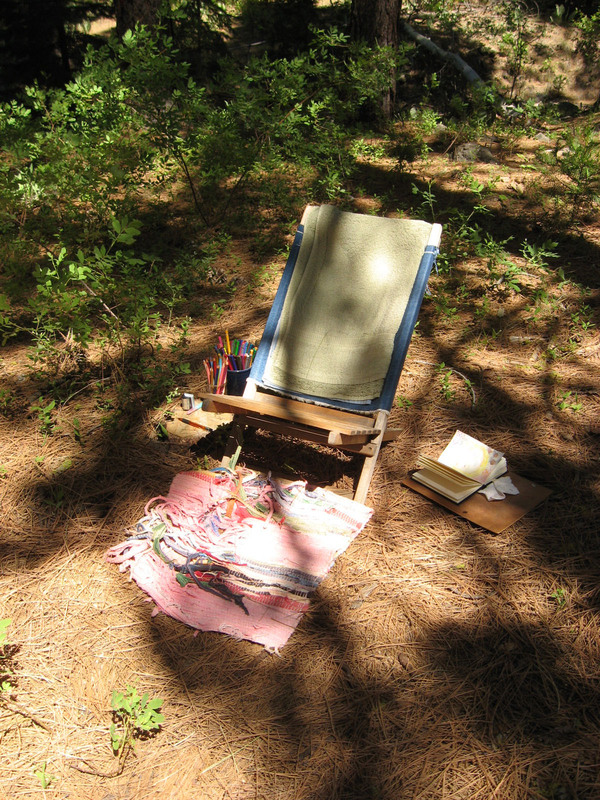 I love your outdoor workspace...I bet we're all going to set up a similar site now that you've inspired us. Always love visiting your blog. Nice work. These are nice sketchbooks too. Thanks for the giveaway. Lynne, I just adore all of your work, esp. the faces and I still long to learn your method of painting. It all speaks to me and I find it oddly comforting. The sketchbooks are very nice and I would love to have one to actually do some painting in. Who knows, I might win something yet! Btw, I love your tutorials, thank you for showing how you go about doing the darling ghostly faces. i have to agree with all the others about your office....loverly! i'd love to have one just like it!!! oh, by the way....Michelle "turned me on to" zentangle....i could practice on those pages, no? Oh, I've been wanting to try one of these books so badly. I've read about them on several artists' blogs over the last few months. BTW, I love your office! Wow, what a fabulous journal - you're an inspiration! If I don't win this I will have to get out and hunt down one to buy! Thanks for shaing and for the giveaway. There's just no knowing when the non-dominant hand is in control hey? Hi Lynne, I would love to win the journal, because of you I am now in love with S & B journals. I would love to try these journals. I am always looking for one I like better than my moleskine. I wish I had an office space like that. Work would seem a lot more enjoyable. Thanks for a chance at the giveaway!! Lovely work in your journal, really like your style of mixing photos with art. I would love to try a Gamma, so hope I'm still in time. And thanks! Your journals are beautiful and inspiring, if I won I would be thrilled and would love to fill up all the pages! am i too late to put my name in the very full hat? Thanks for the where to buy info .... Looks like a wonderful journal that will go everywhere with me if I am the lucky one! Lynne, I enjoy looking at your work. Please toss my name into the hat. Interesting journal! I would love to be the lucky one. a real feast for the senses starting my day with a cup of coffee looking at your beautiful blog. What an inspiration you are. Lynne, it's really sweet of you to offer something so cool to one of us. I've loved your journal work and your faces, and anything you use that gets that kind of result, you send right on over to me! Oh, sure, the talent has to be there, too. So you can come on over as well! Me too! I've been on vacation and am just catching up with my blog reading...who wouldn't love to have such a great journal?! What a generous giveaway! I really appreciate how your share your experience with the journals you try. It is the most challenging part of keeping a sketchbook for me - that darn paper! 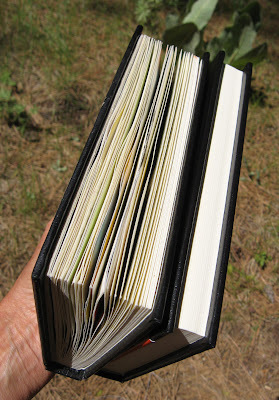 I would love a chance to try this sketchbook out. Thanks for offering the draw.